Peter Oliphant Knight was widely described as a ‘leading citizen’ in early Tampa and Hillsborough County. He arrived with new wife Lillie Frierson in 1890, joined the up-and-coming middle class in Hyde Park, Tampa’s first suburb. There the couple built a heart pine Victorian ‘starter’ cottage at 245 Hyde Park Avenue. Peter Knight’s rise in early Tampa business and civic affairs was rapid and steep. With partners W.H. Kendrick and E.S. Douglas, he organized the city’s first electric streetcar line and founded Tampa Electric Company to provide power and light to the growing populace. As an attorney, he served as counsel to more than a score of Tampa businesses and corporations (including shipping concerns and cigar factories), and was a founding director of the Exchange National Bank. Before long, the Knight family outgrew their little cottage at 245 Hyde Park Avenue. 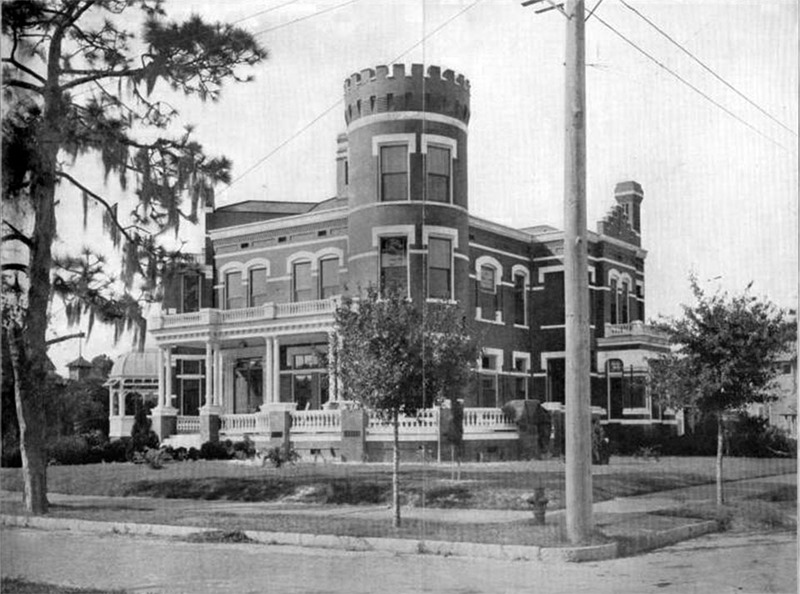 At the start of the twentieth century, the Knights moved just up the street to the corner of Azeele Street and Hyde Park Avenue, where they built a spacious Gothic Revival mansion, its red brick exterior walls set off by pristine Georgia marble. After the death of their parents, the Knight heirs sold the house to an elder care community, and in the 1980s it was torn down to accommodate commercial building on the site. Nothing remains of the original mansion but some brick and granite corner markers and granite low walls. Thankfully, the Knights’ honeymoon cottage at 245 Hyde Park Avenue remains intact. It is now an Historic Landmark and was donated by the Knight descendants in the early 1970s to provide a home for Tampa Historical Society, Inc., which function it still serves. Thanks Dan, from Tampapix.com for locating this historical photograph. 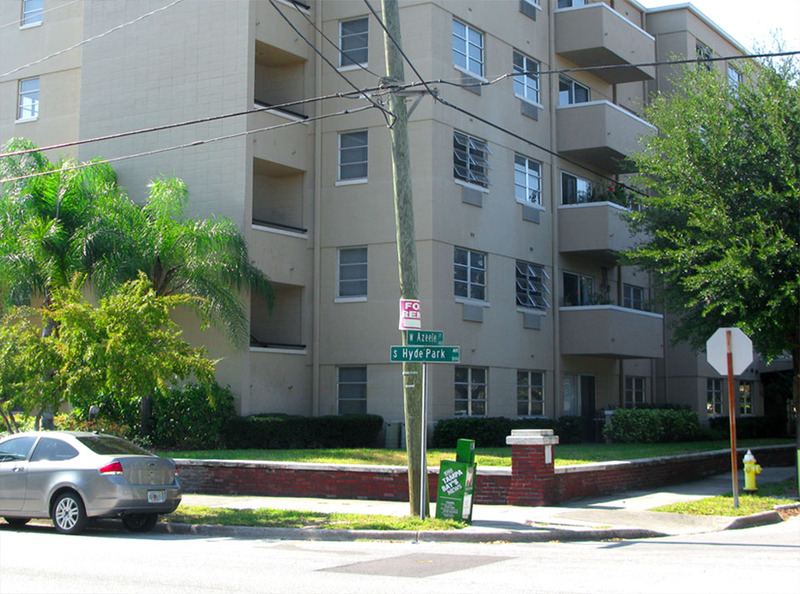 Be sure to visit Tampa Preservation, Inc. for more History Hunts. I can’t believe they demolished that beautiful home! I’ve wondered in the past who Peter O. Knight was. I used to fly into the airport on Davis island that bears his name. You are doing great work Brian. Wow what a beautiful building!!! Too bad its gone! My first job after high school (H.B.Plant) as a lab assistant in 1974 was for 4 internist Dr Peter O. Knight being one of the physician.